 There is a little-known phenomenon in some small corners of the Xenaverse knows as "Gabbashing" (sometimes referred to as "Scabbashing"). The term was coined on the Poteidaia Scroll (a Xena discussion board) in the year 2000. It refers to "any exaggerated negative comments made about the character of Gabrielle, from the television show Xena: Warrior Princess". The reasons for shing are many and varied. A great number of Gabbashers find the character annoying, particularly during Season 1 (the "irritating blonde" syndrome) and Season 4 (the "way of love" fiasco). They think Xena would be a more interesting show without the sidekick, and find her too moralistic and limiting of the Warrior Princess. "I hate ditzy blondes who ruin all the fun!" "I Gabbash because up until Season 4, I really had no problem with Gabrielle, until she went and did a complete 360 in India and THREW HER FREAKIN' STAFF IN THE RIVER!!!! I hate her for all the stuff she put Xena through during that time,"
"That spiritual quest stuff was real hokey, and made her go from lovable irritating blonde ... to just plain irritating,"
"Gab has gone from being a irritating whiny little girl to a Xena wanna be. She never thinks for herself. She stuffs up Xena's plans. She always needs Xena to get her out of trouble,"
 Other Gabbashers are reacting to what they perceive to be "Gabworship". Gabworship refers to "extreme adoration of Gabrielle". In an attempt to balance over-the-top praise of Gabrielle, often while comparing her more favorably to Xena, some Xenites have resorted to pummeling the battling bard. "Get your own life Gabby - stop sucking off Xena's. Hmmmpph..Warrior? Yeah, right Gabby, don't quit your day job,"
 Gabworship includes assuming that all other Xenites think that the character of Gabrielle is the best thing about Xena: Warrior Princess, praising all actions of the bard on the show even if they are portrayed as negative. For example, defending Gabrielle's decision to kill the young man in the episode LEGACY, although Gabrielle herself never defended it. Or writing lengthy passages praising any aspect of her, e.g., writing pages about how good she looks in every single episode of Xena: Warrior Princess, even shows where she has deliberately been made up NOT to look good, such as her ugly sister turn in the episode IF THE SHOE FITS. "They get SO upset. One little negative word about Gabby and they're off their food for a week,"
-- another Xenite aged 34. Gabbashers may also indulge in their pastime because they find it hilarious to torment their Gabworshipping compadres. Most Gabbashers defend their actions by pointing to Xena: Warrior Princess as their inspiration. 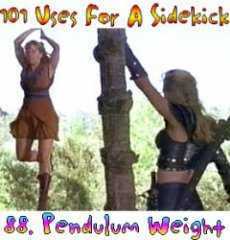 They claim that the show has encouraged Gabbashing, through such instances as the GabDrag (where Xena dragged Gabrielle behind a horse in the episode THE BITTER SUITE), the GabChak also know as Chak-in-the-Head (where Xena hit Gabrielle with her chakram in the episode MOTHERHOOD), and Marinated Gab or the Gab-B-Q (where Gabrielle was basted by the cannibals in the episode THE ABYSS). "In life, you always run across someone who holds you back from being all you can be. The best thing you can do when you meet them is to tie them to your horse and throw them off a cliff. Then, and only then, can you meet your full potential,"
 Gabbashing ranges from the mild to the more fanatical. Some Xenites will not let a positive remark about Gabrielle go unchallenged, while others will only resort to Gabbashing if they feel that Gabworshipping is getting too strong for their liking. Some Gabbashers also extend their criticism to the person of Renee O'Connor, and her acting abilities, whereas others will not indulge in any Gabbashing that they feel is aimed personally at Renee, or too hurtful for the people who admire the character she portrays. Much Gabbashing is limited to putting Gabrielle down in message board threads, especially through the use of a term like "Scabrielle" (which was first used by Xena in the episode IN SICKNESS AND IN HELL) or its shortened form, "Scabby". However, some Gabbashing has become quite creative. Gabbashing Xenites have added witty captions to pictures of Gabrielle, looking for opportunities to make fun of her through humor. A good example of this was a series of pictures entitled "101 Uses for a Sidekick". 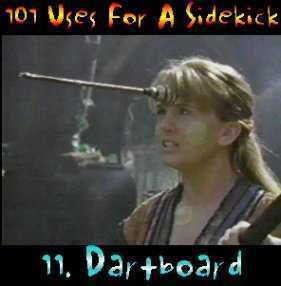 In this series, a picture of Gabrielle with a rubber arrow stuck to her forehead was labeled "dart board", while another picture of Gabrielle, this time nailed to a cross, was labeled "Christmas ornament". Other Xenites have formed societies such as the Gabbasherversity. Still more have written limericks to explain why they dislike the character of Gabrielle so much, with suggestions as to how she could be disposed of. "In the forum I most often converse, the Gabbashers are articulate and funny people who have raised it (Gabbashing) to an art form. It's hard not to join the fun. Plus, they do it in limerick form - how can I resist?" Gabbashers have attracted their share of detracters. While some Xenites find the phenomenon amusing, others have taken great offence, and have resorted to defending Gabrielle from attacks, or have taken a more aggressive stance, and attacked the Gabbashers in turn. This has resulted in stalking and "flaming". Whether you agree with Gabbashing, or feel that it is cruel, it is likely to continue for as long as there are Xenites who love Gabrielle and those who loathe her. Argeaux has wandered hither and thither throughout the Xenaverse, but now resides comfortably at the Poteidaia Scroll, which she co-Administrates. She loves Xena, Argo, Minya, Joxer, and Najara - go figure! By day she works incognito as a novelist, when she isn't housing young people. She has been married since 1988 to a man she refers to mysteriously as "Ares" (no relation). Every now and then she writes something REALLY funny. No, seriously.